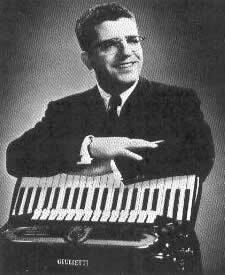 Russ Messina was one of the greatest jazz accordionists. He performed as a professional Jazz accordionist for more than 60 years. Messina's other musical talents included composition, arranging and teaching. Russ was born in Jamestown Virginia. In the late 1940s, he earned a bachelor of arts degree in music from the University of Buffalo in New York. was a World War II Army veteran who served in North Africa, Italy and Germany. He received several commendations from his commanding officers after he entertained more than 175,000 troops during a 120-day USO Camp Show tour. After his service in the military, Russ began offering private lessons in piano theory and the accordion. He performed with various musicians, including members of both the Buffalo and Niagara County musicians unions and the Buffalo Jazz Ensemble. He also appeared in such venues as Kleinhans Music Hall and Artpark, as well as clubs on the West Coast and in Toronto. Russ wrote music for both piano and accordion and produced albums featuring his own compositions. One of Messina's proudest moments, according to his family, was when he coached a music student to a gold medal in an international competition. Messina retired from playing in 1997 after suffering a series of strokes and passed on in 2000. © 2007 Accordia Records All rights reserved.